WEDDING TIP: #85 TAKE A FEW MOMENTS AT YOUR HEAD TABLE TO S - ProudMummy.com the Web's Community for Mums. 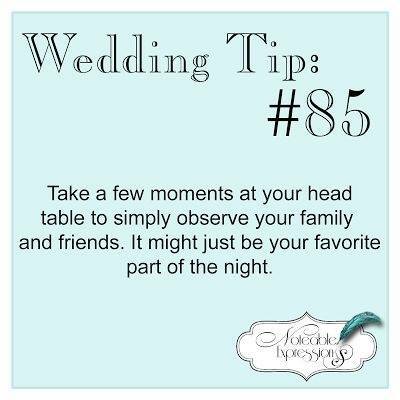 WEDDING TIP: #85 TAKE A FEW MOMENTS AT YOUR HEAD TABLE TO SIMPLY OBSERVE YOUR FAMILY AND FRIENDS. IT MIGHT JUST BE YOUR FAVORITE PART OF THE NIGHT.